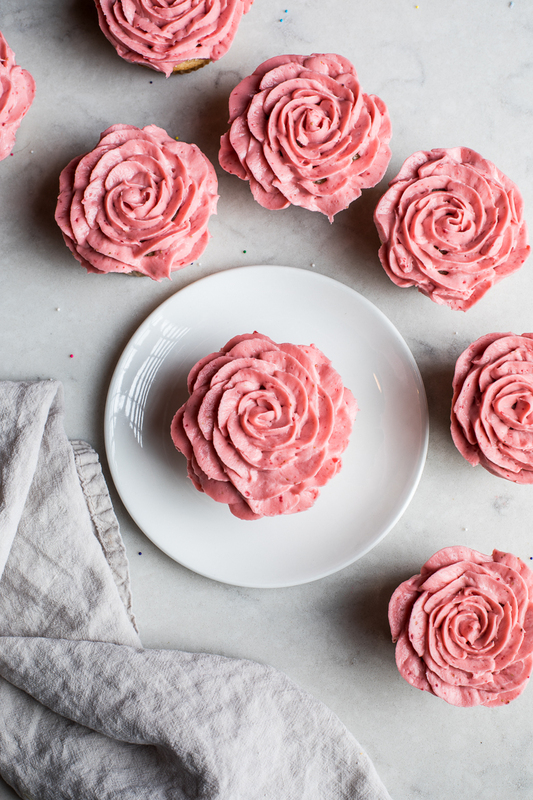 You haven’t truly lived until you’ve made strawberry icing. It’s vibrant, beautiful, sweet and fruity. 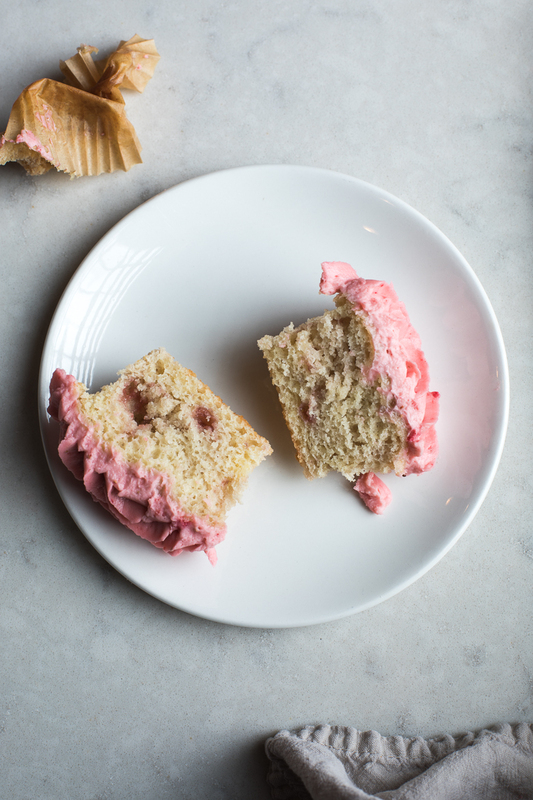 The key to getting that intense strawberry flavor without compromising the structural integrity of the icing is freeze-dried strawberries. Freeze-dried strawberries have been previously frozen, then placed in a vacuum under very low pressures. The low pressure causes ice crystals to rapidly turn from ice into water vapor. The process removes water much more efficiently than traditional drying. Because freeze drying is such an efficient way of removing water from fruit, the fruit retains a lot of the sugar and flavor, making them perfect to add that strawberry punch. For the icing I used a cream cheese base. I found that the slight tang from the cream cheese paired well with the strawberry flavor. 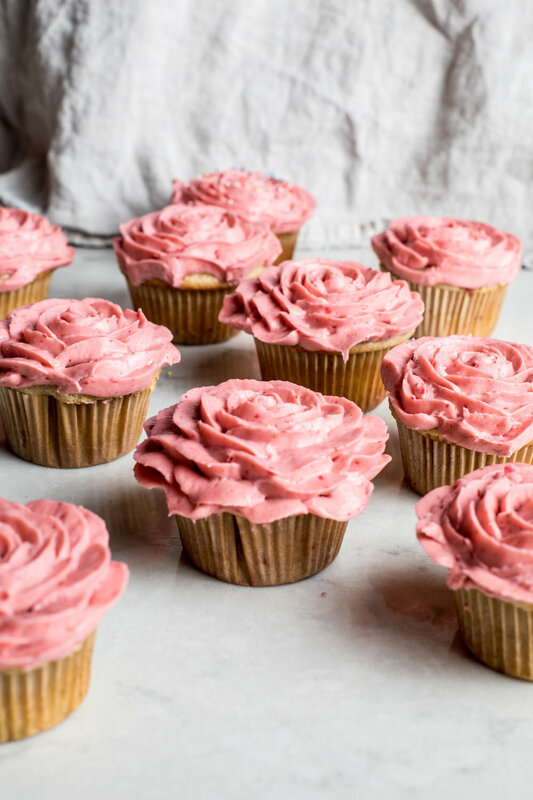 The cupcake recipe is a moist and fluffy vanilla cake with the addition of a few tablespoons of strawberry jam. The strawberry jam flavor is subtle not overpowering. 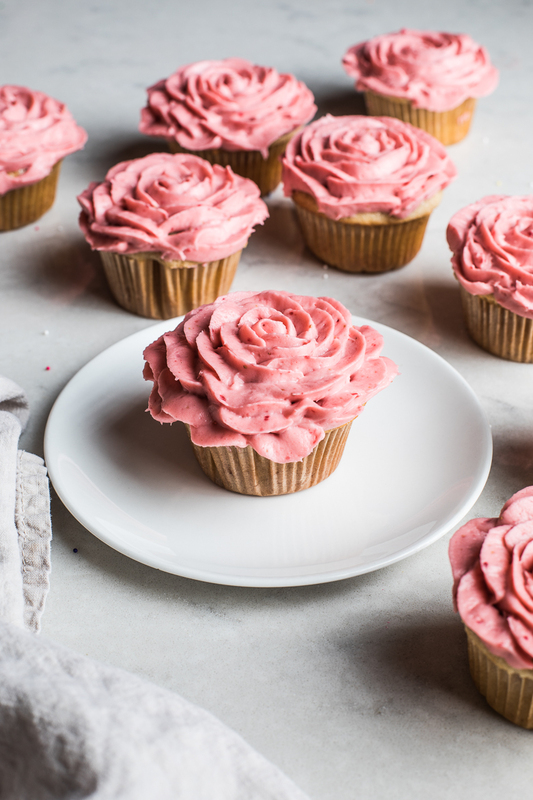 What better way to celebrate spring than these cute flower decorated strawberry cupcakes! In a large bowl, combine the sugar, oil, egg, and vanilla. Beat on medium speed until well incorporated, approximately 2 minutes. Scrape the sides of the bowl. Add the yogurt and beat until combined. Add half of the flour mixture to the wet ingredients and beat on low speed while pouring in half of the milk. Mix until just combined. Add the rest of the flour and milk in the same manner until combined. Stir in the strawberry jam. Divide the batter evenly into the muffin liners. Using a food processor, pulse the strawberries to a fine power. In a large bowl, add the strawberries and cream cheese. Using a hand mixer or stand mixer, beat until combined. Fill a piping bag with the icing. You will need a Wilton tip No. 12 and No. 104. Follow the link for the tutorial. Store the cupcakes in an airtight container either at room temperature or in the fridge for up to 3 days. If you store them in the fridge, let them come to room temperature before eating.